Squash House Quilts: Hello Darkling My New Friend! Hello Darkling My New Friend! Recently my computer has been giving me starts and fits. Many of us have been there and understand! Just so happens, Mr. Squash is into building computers as a hobby. Oh, what a lucky gal am I! He decided a while back to build what they call a small-form factor computer. I asked him what he was going to do with another computer and he said I could have it if I so desired! And I desired! So here she is -- her name is Darkling! Why Darkling, you ask? Well, Mr. Squash gives most of his computers pretty interesting names - Soul Crusher, Dark Side and now Darkling. 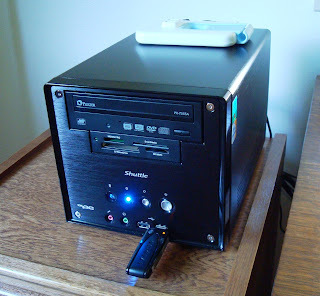 She is very small - sitting here on the top of my 2-drawer filing cabinet she measures just 12"D x 8"W x 7"H. She has everything I need - a DVD drive, a wireless stick, Office 2010, Windows 7 and a few other software programs! Yesterday I transferred over all the files and photos from my old Gateway, and I'm now back in fine form for computing! I can't believe the difference in speed and performance - thanks to Mr. Squash!! On Monday we took a drive down to Baker City and LaGrande, Oregon. It was a beautiful day for a drive, we packed a picnic lunch and off we went! We stopped in Baker City at Traditions Quilt Shop. Cyndy is there all week working for her sister who owns the shop while her sister is on vacation. We had a nice time chatting and then did a little shopping! I purchased another Schnibbles pattern, some wonderful, buttery-feeling wool felt pieces, another of Cyndy's patterns (Mr. Squash wants me to make the pillow for him!) 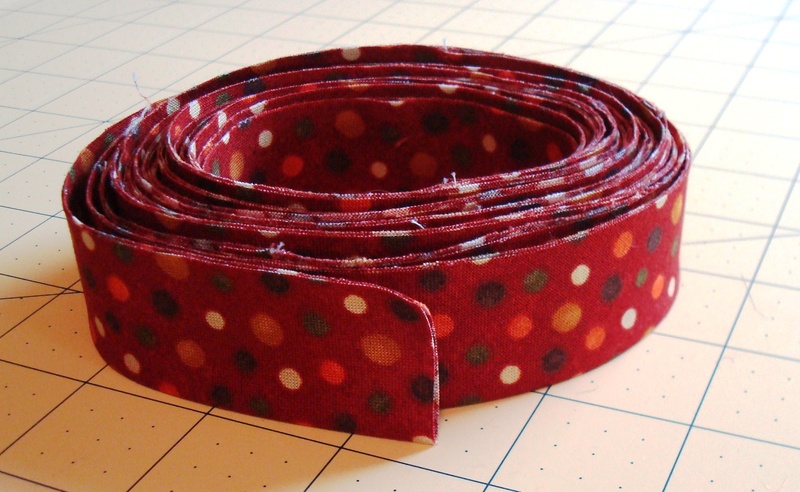 and some fun fat quarters that I will use to make fabric baskets for gifts! I've also been busy machine quilting a project and I made the bias binding for it - all ready to go! I'lI surprise you with the finish later. 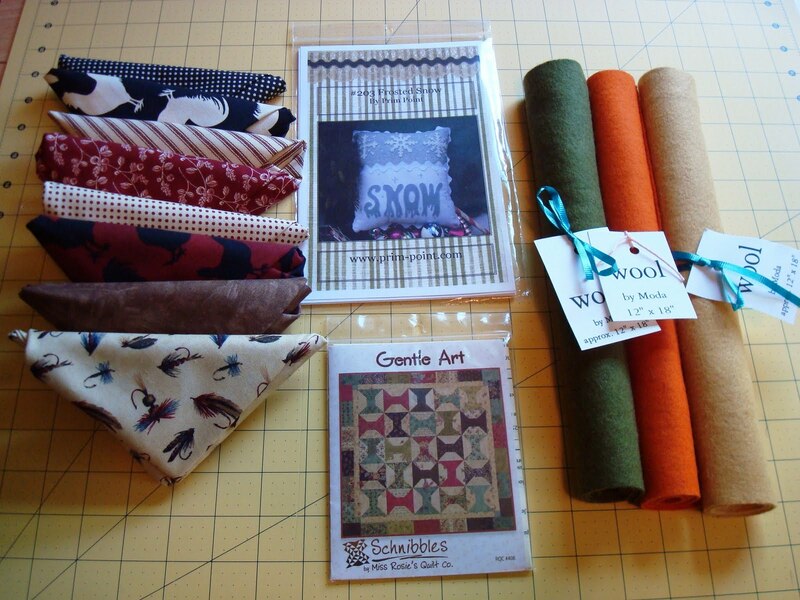 I must say after this last machine quilting project that I am really ready for the longarm! I find stuffing anything larger than a small table runner through my Bernina is just too hard on my hands, shoulders and neck and the viewing area is so small! I just get going, then I have to stop and start to remove pins which does not make me a happy camper! I'm planning to get a Hinterberg Voyager 17 with their Summit table. I've looked at and tried a lot of longarms at various shows and so far this is the one I like best. If anyone reading this has one, I would love to hear your feedback! Darkling is such a cutie, I bet you're tickled to have him. Does this mean you have TWO Mr. Squash's in the house now? I was checking out your "soon-to-be" new addition with the link you shared. I'm am so happy for you. Candace, I just love having mine. No, it's not one of the "big, expensive guys" but just having my own longarm is so wonderful. I have the HQ that hubby got me..literally.."just because". I think Mr. Squssh and hubby are pretty nice men to have around. You'll love having a longarm. The ease of putting the larger quilts on the frame and taking stress off the shoulders and back is priceless. Get what you can afford an splurge if you can for quality! I don't know anything about the Voyager 17 but if it feels right...it is right to you! Have fun! Mr Squash is a keeper! Do I spy fishing lure fabric? So you..if so! Enjoy the day! Electronic appliances that are not performing their best make me want to heave-ho them out the second story window! Glad your little new one is humming along well. Thanks indeed to Mr. S.
A longarm--how exciting! And enjoy your new fabric finds. I have a Schnibbles I want to dive into too. Try as many machines as possible, buy what you can afford and what you have room for in your house. LA's are like cars, they all get you to the destination, but everyone has preferences. I purchased a Nolting Pro 24, but I wanted mine for business. If only for my own quilts, I don't think I would have gotten as much machine as I did. But I love mine. Are you going to hand piece your spools? I have a longarm, Candace...and her name is Nancy! *wink* She's my friend and if I lived to be 200, I'd never come close to her the talent and skills that she possesses. Good luck with your new Voyager 17. I'm looking forward to following your progress. I love Mr. Darkling and the fact that it is so tiny. Mr. Squash is definitely a jack-of-all-trades, huh? I'm really looking forward to hearing of your experiences with a longarm. Last year at our quilt show, I was too timid to try any out. It won't be that way this year! Good luck on your new long arm! I or should I say my DH is in the process of putting one up for me this week. We purchased an Innova which felt like a good fit for me. I tried all of them and this one feels right. Of course, you will have yours up and a dozen quilts done before mine gets built but it's not the destination but the journey, right? What a cute little computer! Isn't it wonderful to have someone around that can make that happen for you. Aww... What cute names for the gadgets... really sweet! It is awesome that you have a custom made computer from Mr.Squash. Enjoy! The wool felt is beautiful and cute schnibbles pattern. A long arm at home will surely make things easy for you. hope you find the best one! Oregon must be the hot spot this time of year Candace...we were just down that way! Love the new computer & all your projects are great! Retirement is looking good to me! Congratulations on getting a new computer! Mr. Squash has done a great job. - You have found some very interesting fabrics. How exciting to get a longarm! Darkling is a fine name for a very handsome puter! Lucky you..Enjoy your quilting machine when you have it. I have had a Gammill for over 12 years and it has served me well. Since we are ready to start preparing for downsizing (whatever that is) I will have to eventually part with it. I am sad about that and really need to finish up my own quilts first. Love those little Schnibbles patterns, they are like little desserts! Pretty handy hubby you have. Good luck with finding the right long arm machine for you. Don't know much about any of them. I just left Cyndy's blog and saw that you had visited the shop. Cute designs. Crazy 8 Strip Teaser Table Topper!